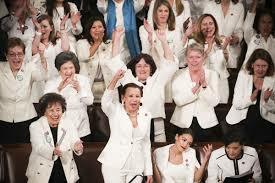 As President Trump delivered his second State of the Union (SOTU) address Tuesday night, there were dosens of additional guests in the Gallery of the US House of Representatives, representing the faces and the impact of Trump's policies on the American people. 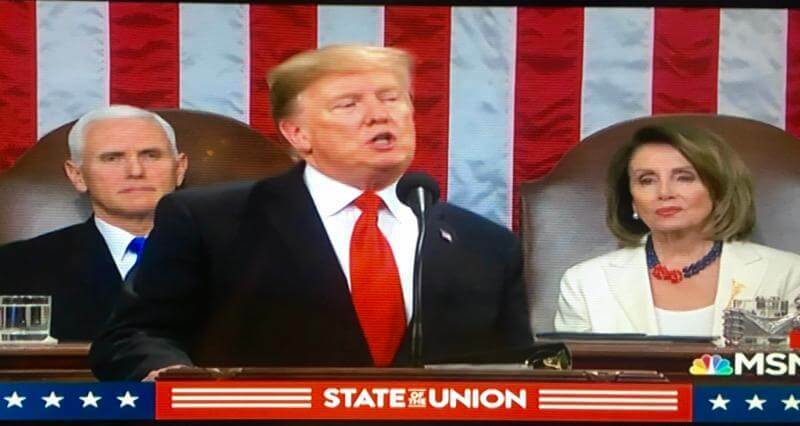 In his first SOTU since the Democrats took the House in November, Trump kept it to a tightly scripted speech, touting the purported accomplishments of his administration, Trump cited "a revolution in American energy," and "a thriving economy" that has most benefited women, "who have filled 58% of the newly created jobs last year." Notably absent: reference to the Government shutdown, gun violence, climate change, the Israeli-Palestinian peace plan, Saudia Arabia, Europe ... all at the forefront of domestic and international policy. He did, however, announce another summit with North Korean leader Kim Jong Un. Although Trump called for unity, he was ultimately unflinching on the Wall: "I will get it built." Among the Presidents most memorable quotes, viewed as a threat by many: "An economic miracle is taking place in the United States and the only thing that can stop it are foolish wars, politics, or ridciulous, partisan investigations." Throughout the speech, Trump acknowledged Special Guests of the White House, a dozen individuals selected to represent the issues facing the nation and his administration's accomplishments and agenda. 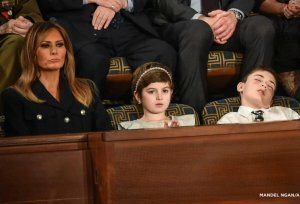 First Lady Melania Trump with special guests Grace Eline and Joshua Trump (no relation), who has been hailed as a "resistance" hero for falling asleep. Family of Gerald and Sharon David, a couple found shot to death in their homes in January, at hands of El Salvador native who was in the US illegally * Matthew Charles, former drug-related convict released after Trump signed the First Step Act into law * Grace Eline, survivor of brain cancer * Ashley Evans, opioid and substance abuse survivor * Elvin Hernandez, DHS Special Agent, Trafficking in Persons unit * Roy James, Vicksburg Forest Products Plant Manager * Alice Johnson, whose life prison sentence was commuted by Trump after a meeting with Kim Kardashian West * Timothy Matson, Pittsburgh SWAT and survivor of 2018 Tree of Life synagogue shooting * Judah Samet, Holocaust survivor and Tree of Life shooting survivor * Tom Wibberley, father of Navy Seaman Craig Wibberley, who was killed on U.S.S. Cole. Sixth grader Joshua Trump, bullied because he shares the President's last name, and who is part of First Lady Melania Trump's anti-bullying "Be Best" campaign, stole the show. As did last minute addition, former Astronaut and Apollo 11 crew member Buzz Aldrin, whom Trump acknowledged when noting the 50th anniversary of the lunar mission this year. 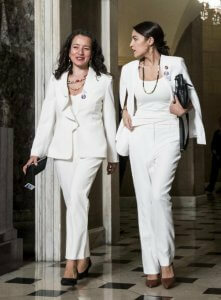 Each Member of Congress is allocated one guest to the State of the Union -- and, with it, a message to the President. Members of Congress, each allowed to bring one guest themselves, filled seats with constituents who were victims of Trump's policies. Before an historically diverse, and fired up, 116th Congress, including a dozen potential presidential opponents (of both parties), the President spoke for 81 minutes. Amidst the sea of dark suits and female Democratic members in suffrage white, were more than a hundred sets of additional eyes -- from a Costa Rican immigrant who worked as an undocumented housekeeper for Trump, to gun tragedy survivors and women's health and rights advocates, to labor leaders and future movement leaders. Among the guests were those invited by four Senators, all presidential candidates. Guest of Senator Cory Booker (NJ). Edward Douglas, a former federal inmate from Chicago, who became eligible for release from prison in January after Trump passed the First Step Act, was sentenced to life in prison in 2003 for selling 140 grams of crack cocaine. Booker is bringing Douglas to highlight his commitment to criminal justice reform. Guest of Senator Kamala Harris (CA). Trisha Pesiri-Dybvik, an air traffic controller from California, who lost her home in the 2017 Thomas Fire when it hit Ventura, California, and was among the 800,000 federal workers who missed paychecks during the government shutdown. Guest of Senator Kirsten Gillibrand (NY). US Navy Lieutenant Commander Blake Dremann, a transgender Navy officer, to spotlight Gillibrand's efforts against Trump's decision to ban transgender people from the military. A decorated military member, Dremann is president of SPARTA, an LGBT military advocacy organization focused on transgender service members. Guest of Senator Elizabeth Warren (MA). Shahriar, a U.S. Department of Housing and Urban Development employee was furloughed during the 35-day government shutdown. Shahriar, also Vice President of AFGE Local 3258, missed paychecks during the shutdown and organized with fellow federal workers to push for the government to re-open. 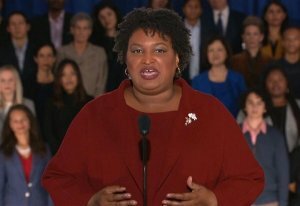 In a passionate and decisive speech, Stacey Abrams delivered the official Democratic response to the SOTU. Abrams, who was unsuccessful in her campaign for the 2018 Georgia Governor's seat, is a rising star and an inspiring symbol of grit. Abrams condemned the divisive politics of the White House and the government shutdown, calling it "A stunt, engineered by the President of the United States." Striking on a number of themes, she criticized the Republican Tax Bill for its unfairness to working people, and called for compassionate treatment at the borders, saying "Democrats stand ready to effectively secure out ports and borders, but ..."
In a final tone of bipartisanship, however, Abrams called for Americans to "come together and stand for, and with, one another." While "disappointed" with Trump's approach to governing, she said, "I still don't want him to fail ... But we need him to tell the truth." The factcheckers are still busy. Convention Central: Celebrate with the Italians in Philly!